Emily Carlin is an intuitive and eclectic witch. Starting at age five or six she realized she could sense and communicate with energies and beings of which others weren’t even aware, and was naturally interested in Pagan practices. She’s always felt drawn to things that were a bit darker, and a few dark things were drawn to her too which made for a growing up experience that was both interesting and terrifying. She spent her teen years devouring just about any book on magick, monsters and the occult that crossed her path. Leaving her native Seattle for college at Wellesley, a day trip to Salem, Massachusetts catalyzed everything Emily had been experiencing and formally launched her formal study of Paganism and Magick. Her first Samhain at college saw her finding other Pagans and attending her first ritual. What was an ordinary ritual for the group turned into a major experience for Emily: she “wandered off” on her own during the guided meditation and found her spirit guides and magickal allies. During college Emily continued her magickal studies alongside her mundane ones. After completing her undergraduate studies she returned to the Pacific Northwest and enrolled in Seattle University School of Law, earning a JD and becoming a member of the WSBA. At the same time she joined the Grey School to further her magickal studies. She graduated with a specialization in the Dark Arts and soon joined the faculty and became the Dean of the Dark Arts department, later joining both the school administration and Board of Directors. She left the Grey School in 2011 to focus on personal projects. 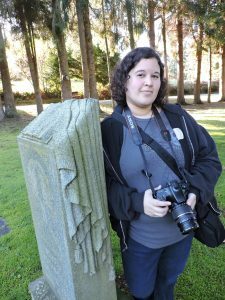 In 2015 Emily co-founded Illustris, a Seattle group dedicated to facilitating collaborative public ritual. Collaborative ritual is the practice of performing ritual that is built on-demand to meet the needs and interests of the participants, rather than being pre-scripted. It has the goal of creating a welcoming and inclusive ritual that focuses on the participants rather than the facilitators. The group ran for two years, performing public Sabbat rituals in public parks and then at Edge of the Circle Books. Over the years Emily has published many works on magick. Defense Against The Dark is her first book – a handbook on encounters with things that go bump in the night and how to deal with them. She has two blogs: Exoteric Magick, focused on pop culture magick, and Blacksun Magick, her personal blog. She also features extensively in the Llewellyn Annuals and has had essays published in various anthologies. Today her focus is on sharing her personal style of magick with fellow practitioners and strengthening her local community. You can find her teaching workshops and leading rituals at various events in the Pacific Northwest, as well as participating in events present by Pagan Renewal Seattle.